After about 10 natural days, I got an email saying my exam results are ready. So I went immediately to review. All was good, I got minimum English qualifications for the NOC career I have. If you have a NOC A or 0 careers, your minimum qualification must be 7 in the CLB scale in all competencies. 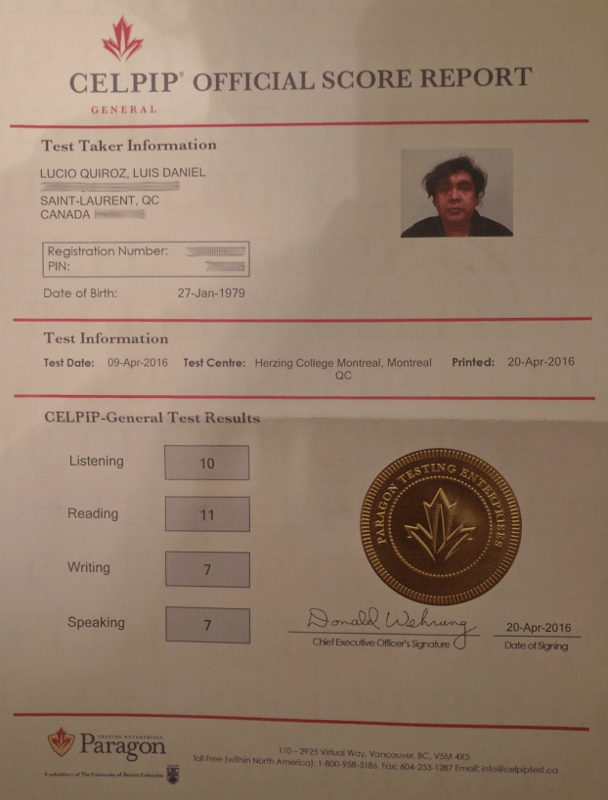 One week later, I got two hard copies of my result. These papers are for yourself. If you are doing any process that involves government (such as immigration application), you just need to take note of the registration number and pin number; they will access your results electronically. For those who are asking what 7 means, I put here the meaning of the grades. If you did not get the results you want, it is very important you study more before retrying. CELPIP is not a cheap exam. The CELPIP exam is not as an English exam in the high school. You will not find grammar, spelling or vocabulary questions; instead, you will be evaluated in a comprehensive way when writing a letter or when calling by phone. For all those who were in my situation, I have put for you all these Free CELPIP study resources. As for the speaking tests, I just can tell you that if the exercise says 30 seconds, speak 30 seconds; do not finish before and keep big silence at the end. As for exam graders' eyes, doing this means lack of skills even if you are just a few words person.